Is a one tablet per day vitamin without iron what you want Maxi-Health Research® is proud to bring you the ultimate daily multi with minerals for maintaining good health. Maxivite™ is a well-balanced daily supplement containing the appropriate levels of vitamin A,B,C, D and the E vitamins with a number of chelated essential minerals. 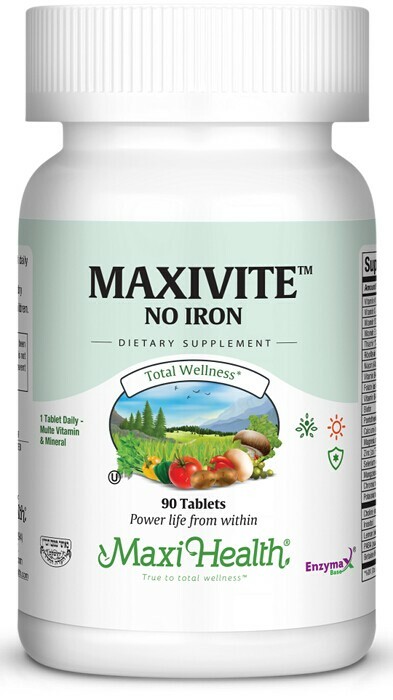 Make Maxivite™ (No Iron) part of your daily routine. Take one (1) tablet daily with a meal, or as directed. Other Ingredients: Microcrystalline cellulose, vegetable stearine, modified cellulose gum, magnesium stearate, Enzymax® (calcium carbonate, bromelain, papain, lipase, amylase, protease, silica), silicon dioxide, and aqueous film coating. This product contains no wheat, gluten, fish, salt, milk, artificial flavors or colorings. CaroCare® is a registered trademark of DSM Food Specialties. • Enzymax®, a vital digestive enzyme complex, is a registered trademark of Maxi Health Research® LLC. • Selenium SeLECT® is a registered trademark of Sabinsa Corporation. • TRAACS® is a registered trademark of Albion Laboratories, Inc.